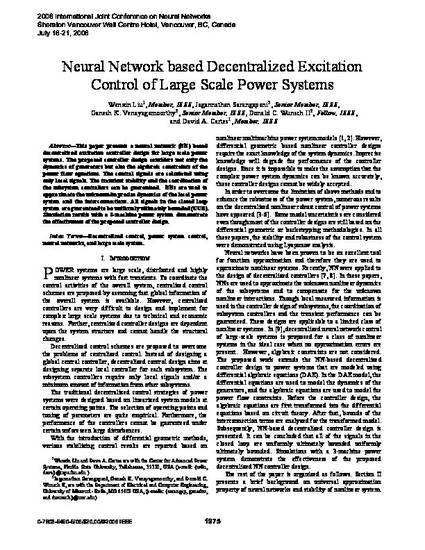 This paper presents a neural network (NN) based decentralized excitation controller design for large scale power systems. The proposed controller design considers not only the dynamics of generators but also the algebraic constraints of the power flow equations. The control signals are calculated using only local signals. The transient stability and the coordination of the subsystem controllers can be guaranteed. NNs are used to approximate the unknown/imprecise dynamics of the local power system and the interconnections. All signals in the closed loop system are guaranteed to be uniformly ultimately bounded (UUB). Simulation results with a 3-machine power system demonstrate the effectiveness of the proposed controller design.